How Did Insight Racing Start? IInsight Racing was founded by Grayson Randall when the United States Defense Advanced Research Projects Agency (DARPA) announced the first DARPA Grand Challenge nearly four years ago. Other members of the team were graduates and later mentors of the South East Raleigh High School FIRST Robotics team. These four North Carolina State University Engineering students and Grayson formed a self-funded entry into the Grand Challenge. With a converted 1987 Chevy Suburban and second-hand computers the team assembled a full-scale autonomous robot and was one of only 20 teams out of over 100 entries to be selected to compete in the National Qualification Event for the first race across the Mojave Desert. Lack of funding prevented the team from participating in the first race but did not deter further development of the vehicle. When no initial entry was able to travel more than seven miles of the 150 mile course, DARPA announced a second race. As a result of their relative success, Insight Racing attracted several new members to the team for Grand Challenge II, including three NCSU alumni. At that time, NCSU became an official sponsor of the team and Dr. Robert Fonaro began offering projects related to the Grand Challenge in his Computer Science Senior Design classes. To date, over 40 students have participated in this program. For the second Grand Challenge, DARPA received 195 entries from 36 states and four foreign countries and added new qualification steps to achieve an invitation to the finals. The first step was a site visit and demonstration of the autonomous vehicle’s capabilities. Utilizing the University’s farm in Butner, the team set up a course where DARPA officials witnessed an almost flawless demonstration. As a result, Insight Racing was one of 43 teams selected for the next level, the National Qualifying Event at California Speedway. At this point the team secured enough funding to ship the vehicle and send the team on to California. Twenty teams would be selected to move on to the Desert for the finals after successfully completing three trials on a rigorous 2.7 mile obstacle course with tank traps, cars, barriers, cones and tunnels. Once again the Insight Racing Team moved on and was in the finals against some of the most well established teams. This was truly a “David and Goliath” situation. During the finals, the Insight Racing Team finished in 12th place after running as high as 6th place during the race. Insight did finish ahead of some well-known University teams such as MIT, Cornell, Princeton, UCLA, Cal Tech, Texas, Auburn, Florida and Louisiana as well as a great number of private enterprise teams. The next DARPA Challenge is an Urban Challenge requiring autonomous operation in an urban environment including traffic and all the rules of the highway. Insight Racing with new sponsorships, and increased participation from NCSU students and staff expects to be competitive once again. On August 9, 2007, DARPA announced that Insight Racing was invited to the Urban Challenge National Qualification Event. The final Urban Challenge race is set for November 3, 2007. 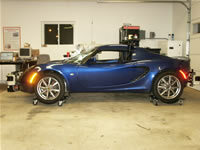 This time Insight Racing will arrive in California with a Lotus Elise provided by Lotus Engineering and Lotus USA. This sleek sports car is already quite a star. The Lone Wolf, as it is called, has twice appeared on the Discovery Channel’s “Daily Planet” show and is scheduled to air on a BBC special called “The Future” this fall. Watch our web site for more details.